Here is his website and you can email Ramesh at rsingh@chapman.edu. 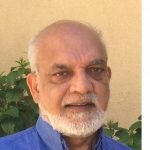 Ramesh Singh is presently Professor with the School of Earth Science and Environmental Sciences, Schmid College of Science and Technology, Chapman University, California, USA. Prior to joining Chapman University, he was Professor with George Mason University, Fairfax, Virginia, USA during 2007-2009 and Distinguished Visiting Professor (2003-2005) with the Centre of Earth Observing Space Research. He served Department of Civil Engineering, Indian Institute of Technology, Kanpur, India during 1986-2007 as Professor (1986-2007). He has supervised project work and thesis of M.Tech. and Ph.D. students in the field of Remote Sensing, Engineering Geosciences, Natural Hazards and Atmospheric pollution and Applied Geophysics. He had organized training workshop in China and India for scientists from South Asian countries. His two edited books on Natural Hazards is recently published by CRC T & F Press. Dr. Singh has worked on all kinds of Natural Hazards (floods, cyclones, tsunami, dust storms, earthquakes, landslides, droughts, forest fires), atmospheric pollution and earthquake process focused. Dr. Singh has published more than 200 publications in peer reviewed Journals, and edited several books and Proceedings of the International Conferences. He is recipients of Indian National Remote Sensing, National Mineral and Hari Om Ashram Prerit awards and a fellow of Indian Society of Remote Sensing and Indian Geophysical Union. Dr. Singh visited Free University Berlin, Germany as an Alexander von Humboldt Fellow and Hirosaki University, Amori, Japan as a JSPS Fellow. He was Vice Chair of the International Committee on IUGG GeoRisk Commission and member of the EMSEV Bureau and is the Chief Editor of Geomatics, Natural Hazards and Risk, Associate Editor of the AGU new Journal on Geo Health, Associate Editor of the International Journal of Remote Sensing and in the past Chief Editor of the Indian Journal of Remote Sensing. His main area of interests are Natural Hazards, Atmospheric pollution, Seismic Risk evaluation and Urban environment.